Posted December 10, 2015 by Heather Michet & filed under Crow Living, DIY, Food, Gardening. Grow more food from the scraps of purchased, organic veggies instead of putting them in the compost or giving them to the chickens, even though both of these options are good and valiant alternatives to throwing the food in the trash 🙂 You will harvest some lovely young greens from what was going to be tossed, resulting in great nutrition right from your yard or patio. Save the stalk root ends of greens & other produce such as lettuces, chard, turnips, carrots and spinach. After using the edible parts, cut a bit off of the root end (where it was cut for harvest) and plant! Carrots with the green tops still attached – Cut the top part of the carrot just below where the greens are attached, leaving about 3 inches of the green stalks. Eat the carrot and plant the top! Turnips – Same as carrots. Turnip greens are mildly flavored with a slight green taste and chock full of antioxidants and other nutrients. And you would have missed these if you’d tossed the top end of the turnip! Lettuce – Romaine and Boston (butter) lettuce heads work very well. Remove the lettuce leaves from the stalk, leaving the stalk intact. Allow a few of the small inner leaves to remain on the stem, then plant. One more round of yummy before becoming compost! This is also an easy way for those who don’t have garden space to grow some of their own food as these cuttings can be grown successfully in containers. 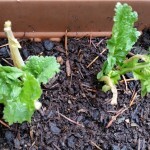 Pictured are young turnip greens growing in my container. These gorgeous – and delicious! – leaves are thriving from turnip tops that originally came Slice of Heaven Farm turnips. Yum!